Description: Former LV RS-11 401 (CR 7610) at the Bethlehem engine terminal. Description: Former LV RS-11s 401 (CR 7610) and 403 (CR 7612) at the Bethlehem engine terminal in April, 1977. Description: Former LV RS-11's 401 (CR 7610) and 403 (CR 7612), along with SD-9 6908, prepare to move through the Bethlehem engine terminal in April, 1977. Description: Former LV RS-11 401 (CR 7610) moves RS-11 7612 and SD9 6908 to the Bethlehem turntable in April, 1977. 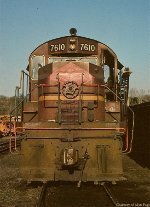 Description: Former LV RS-11 401 (CR 7610) at the Bethlehem engine terminal in April, 1977. 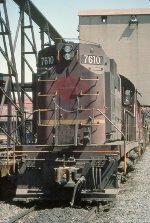 Description: Nose shot of CR RS-11 7610, ex-LV 401, outside the Bethlehem roundhouse in April, 1977. Description: 4 ex LV RS-11s head East out of Sayre. Description: Looking down on an ex LV RS-11 from the Sayre footbridge.